(BOSTON) — Researchers at the Wyss Institute for Biologically Inspired Engineering at Harvard University have created a gut-on-a-chip microdevice lined by living human cells that mimics the structure, physiology, and mechanics of the human intestine — even supporting the growth of living microbes within its luminal space. As a more accurate alternative to conventional cell culture and animal models, the microdevice could help researchers gain new insights into intestinal disorders, such as Crohn’s disease and ulcerative colitis, and also evaluate the safety and efficacy of potential treatments. The research findings appear online in the journal Lab on a Chip. The gut-on-a-chip mimics complex 3D features of the intestine in a miniaturized form. Here, blue and red liquid is pumped through the device to help visualize the upper and lower microchannels. Building on the Wyss Institute’s breakthrough "Organ-on-Chip" technology that uses microfabrication techniques to build living organ mimics, the gut-on-a-chip is a silicon polymer device about the size of a computer memory stick. Wyss Founding Director, Donald Ingber, M.D., Ph.D., led the research team, which included Postdoctoral Fellow, Hyun Jung Kim, Ph.D; Technology Development Fellow, Dan Huh, Ph.D.; and Senior Staff Scientist, Geraldine Hamilton, Ph.D. Ingber is also the Judah Folkman Professor of Vascular Biology at Harvard Medical School and the Vascular Biology Program at Children’s Hospital Boston, and Professor of Bioengineering at Harvard’s School of Engineering and Applied Sciences. The new device mimics complex 3D features of the intestine in a miniaturized form. Inside a central chamber, a single layer of human intestinal epithelial cells grows on a flexible, porous membrane, recreating the intestinal barrier. The membrane attaches to side walls that stretch and recoil with the aid of an attached vacuum controller. This cyclic mechanical deformation mimics the wave-like peristaltic motions that move food along the digestive tract. The design also recapitulates the intestinal tissue-tissue interface, which allows fluids to flow above and below the intestinal cell layer, mimicking the luminal microenvironment on one side of the device and the flow of blood through capillary vessels on the other. In addition, the researchers were able to grow and sustain common intestinal microbes on the surface of the cultured intestinal cells, thereby simulating some of the physiological features important to understanding many diseases. These combined capabilities suggest that gut-on-a-chip has the potential to become a valuable in vitro diagnostic tool to better understand the cause and progression of a variety of intestinal disorders and to help develop safe and effective new therapeutics, as well as probiotics. The gut-on-a-chip could also be used to test the metabolism and oral absorption of drugs and nutrients. "Because the models most often available to us today do not recapitulate human disease, we can’t fully understand the mechanisms behind many intestinal disorders, which means that the drugs and therapies we validate in animal models often fail to be effective when tested in humans," said Ingber. "Having better, more accurate in vitro disease models, such as the gut-on-a-chip, can therefore significantly accelerate our ability to develop effective new drugs that will help people who suffer from these disorders." Gut-on-a-chip represents the most recent advance in the Wyss Institute’s portfolio of engineered organ models. 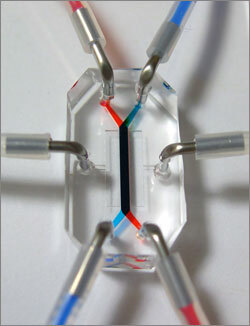 The platform technology was first reported on in Science in June 2010, where a living, breathing, human lung-on-a-chip was described. That same year, the Wyss received funding from the National Institutes of Health and the U.S. Food and Drug Administration to develop a heart-lung micromachine to test the safety and efficacy of inhaled drugs on the integrated heart and lung function. In September 2011, the Wyss was awarded a four-year grant from the Defense Advanced Research Projects Agency to develop a spleen-on-a-chip to treat sepsis, a commonly fatal bloodstream infection.